Warm Apple Pie Pancakes are the perfect thing for a Fall breakfast or brunch. 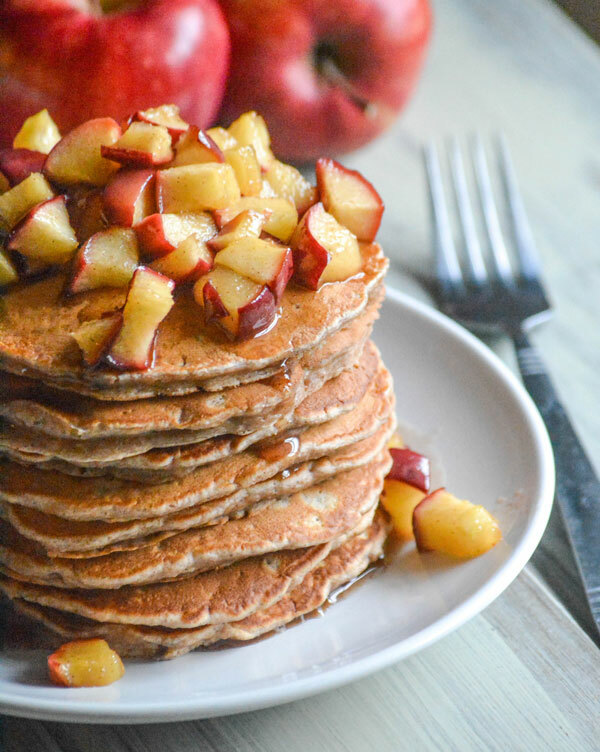 With hints of cinnamon, nutmeg, & clove, these stacks are topped with a warm sauteed apple syrup. It’s a whole some dish, with just the right amount of sweet thrown in. Get your apple pie fix, without all the work since it’s not just for dessert anymore. I can’t think of anything more American to devour on Thanksgiving than an ooey-gooey heap of caramelized apples piled into a crispy, buttery crust. A good apple pie can be oh-so-good, but a bad one, well, it’s just flat out depressing. Unfortunately a lot can go wrong when it comes to the classic dessert, and I’ve yet to find/perfect a solid pie crust recipe. But the sons and I have found a way to still get our festive fix. All the makings of a great apple pie, in a fun taquito shape. 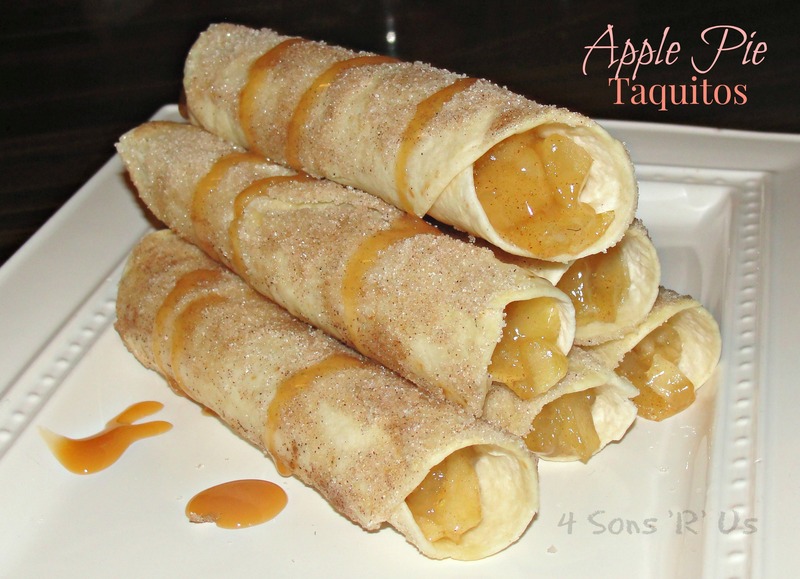 Apple Pie Taquitos. It’s genius! And, again, it’s fun. And the sons and I are all about some fun. Serve em up warm from the oven with a drizzle of caramel syrup and a generous scoop of vanilla ice cream for a delicious dessert you’ll really be thankful for! 1. Combine the cinnamon and sugar on a plate. 2. Empty the can of pie filling onto a cutting board and chop up the apples into bite-sized pieces. 3. Lay a tortilla flat and top with about 3 tablespoons of the apple pie filling. Tightly roll up the tortilla. Brush the outsides of the taquito with butter, then roll it in the sugar/cinnamon mixture to coat the outside. Place the taquito in a 9×13 inch baking dish. Repeat with remaining tortillas and apple pie filling. 4. Bake at 350 degrees for 15 minutes or until the taquitos start to get golden on top. Drizzle with caramel syrup before serving.